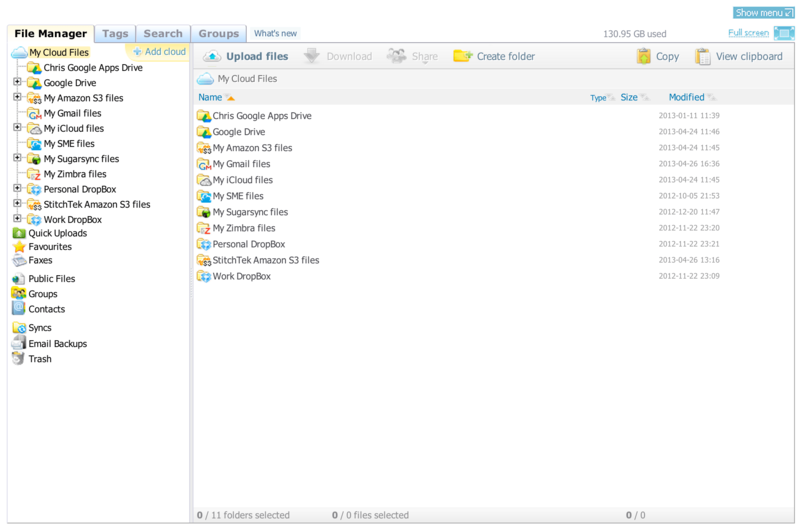 In the ast few months I have been experimenting and playing with a number of Cloud Storage Vendors. In fact I have become quite the fan of some of them for the ease of use for file sharing, streaming, podcasting, image and content distribution and just offsite storage backups. As I have been experimenting I also was looking for something to manage all these various storage islands and even quickly move data from one to the other. Well, I am pleased to say I have had enough stick time with one vendor that I wanted to let everyone know about it. Let me start by saying I am using various Cloud Storage Vendors based on the different specific purposes I need them for and below is a quick list of what I am using and the use case. Currently I am still using the free DropBox level, but I have been using a lot of Google Drive Space and I do pay for that. The upside is it’s $9.99/month for 200GB so it’s rather cheap. I am paying for S3 and CloudFront, but it’s also under $5/month right now. As you can see there is very little crossover for the different purposes I use the various providers for. CloudFront as a CDN does just that function Although it is using in some cases Amazon S3 Buckets for the back-end in the base of the Podcasts, but for the WordPress websites it does a direct pull of all the images from the web server and the W3 Total Cache Plugin handles the redirections. Google Drive so far has been the easiest for me to share personal files with other family members and backup files that were in my house. Because of the YouTube integration I have recently learned that you can also video videos directly online from your Google Drive and even embed them without the need for a YouTube Channel. In some ways this seems to me that you are no longer bound by the YouTube restrictions of file size uploads and other things. There is also no suggested videos or YouTube based links in the video embedding, so you can privately share video links with people. The integration with Google Docs also makes simple documents and spreadsheets easy to manage with others. In my case my internet connection is BEYOND slow for download and worse for upload. I needed a solution that used faster bandwidth and I found it! The solution is called Storage Made Easy. What these folks do is not only unify your Cloud Storage Providers, but they give you the ability to drag and drop files from one to the other. You can even copy files using an Import/Export feature. The best part, is the bandwidth is all theirs! You do need to pay for the service, but there is a Personal Lifetime option for a one-time $59.99 charge. I can tell you in the times I have already used the ‘Single Pane of Glass’ the $60 paid for itself. There is no recurring fee and you get unlimited bandwidth to move your files around. You can connect up to 30 Cloud Storage Providers and go to town from day one provided you already have multiple accounts. You can see the File Manager below and there is also desktop based tools for Windows, Linux, and OSX. Try Storage Made Easy for yourself and see just how easy it is to move files between the various Cloud Storage Providers. I bet you will be like me and decide that $59.99 is a short investment when you have some large chunks of data you need to move. Of course it does not solve my initial uploads to the provider of my choice, but it does make moving files around a LOT less painful. Please leave comments if you have tried the service or you decide to try it and let me know what your feelings are!